What would your game list be for a N64 Classic Edition? With the amazing success and popularity of SNES Classic and NES classic editions it seems more than likely we'll see a N64 or a Gameboy classic edition soon. Especially with how much Nintendo has been hinting around about it . What 10 games would you choose to be on the N64 classic edition if it ends up coming to fruition? . I only say 10 because I think they will have a smaller lineup of games for memory restraints like the SNES did. It also makes this more fun as you won't be able to list every game . Also Keep in Mind games like Banjo Kazooie, Tooie, Goldeneye, Perfect Dark and Conker's are all owned by Rare and most likely wouldn't be allowed. What would your N64 classic edition line up look like? 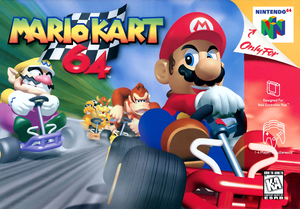 Re: What would your game list be for a N64 Classic Edition? I will say, if a Pokemon game is on the N64 Classic, it won't be any of the Stadium games because of the near-necessity of the Transfer Pack. Just 10, huh? I can do that. It'll be mostly first party stuff. That was pretty tough. I think 15 would have been better. I had to cull some good ones. That's a tough challenge. I'd like to get a good mix so I wouldn't want to include games that are too similar, so keep that in mind. Any 10 of these and I'd be pretty happy. There's no way that this thing, if ever released, only has ten games. I mean even with the N64's extremely limited library everyone is still having to leave off decent to good first party games, Mario sports and the like. I also included two Rare games in my list. Its not as far fetched as you think, Microsoft is not in the plug and play market, would get paid a small amount for the use of the games, and could view their inclusion as free advertising for intellectual property that they are still intent on selling to people. Indeed, they'd probably be actively pushing for Killer Instinct to be included, but I left it off because the game itself isn't all that good. The N64 is my favorite Nintendo console so picking just 10 is really challenging. I will go with 10 (however impossible some of these would be due to licensing), but will also put in 15, just in case. I guess look at 11 through 15 as honorable mentions or alternatives to some of the more impossible inclusions.